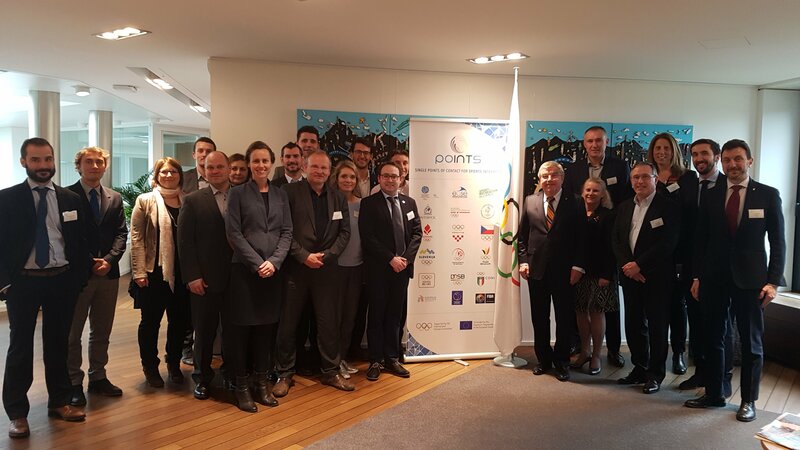 On 10 and 11 April, the POINTS project organised its second meeting, hosted by the International Olympic Committee, in its current headquarters. During this meeting, 19 participants from partner organisations of the POINTS Project pursued the work engaged during the Kick-off meeting on the implementation of the first phase of the project focusing on the development of Guidelines for Single Point of Contact. In her welcoming words, Pâquerette Girard-Zappelli, IOC Chief Ethics and Compliance, stressed the priority given to integrity activities by the IOC before underlining that “Our obligation, as sport organisation, is to protect the sport as well as the credibility of sport”. The IOC is an associated partner to the POINTS Project and is deeply involved in the implementation of the project. Presentations and discussions regarding the structure of the Guidelines were the main points on the agenda. In addition three external speakers, Carlos Schneider, Legal Counsellor at UEFA, Yann Hafner, Legal Affairs Manager at FIVB and Brett Clothier, Head of the Athletics Integrity Unit of IAAF provided insights from their practical work on integrity topics to the participants. Following the presentation of the structure of the Guidelines by Folker Hellmund, Head of EOC EU Office and Valentin Capelli, Project Manager, the group agreed on a first set of key elements including the definition of the concept of Single Point of Contact, the list of topics covered for his/her activities or the framework of his/her activities and responsibilities. Participants also agreed on the necessary flexibility of the Guidelines, in order to allow organisations to adapt the role of their Single Point of Contact according to their specific situations. The EOC EU Office, in close cooperation with the consortium, will work on an updated version of the Guidelines with the objective to present the document during the next meeting of the group that is foreseen for 10 and 11 July 2018, in Prague, Czech Republic.